Finally there is a way to make sure that even the most challenging feed material reaches the extruder screw without clogging or caking. Even light, fluffy or moist compounds must feed continuously into the extrusion equipment to ensure a high-quality end product. Inconsistency also affects productivity and material can even clog before it reaches the packers above the feeding screw that are designed to help achieve perfect flow. 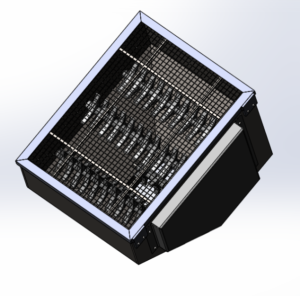 Diamond America’s research and development team has recently designed a hopper chute that helps convey feed material all the way to the screw, all the time. The technology works even for the very large chutes required to accommodate long production runs and keeps the operation safe. Over the years, many methods have been tried in attempts to achieve consistent, trouble-free feeding; the addition of vibration to keep the solids agitated, augers for feed control and even blasts of air to prevent caking. Each of these methods has some merit but none work as well as the new, improved chute configuration from Diamond America, illustrated here. The first thing to notice is the individual wheels that have been added to shafts throughout the hopper. These allow for the addition of cogs, if required, that can be shaped to suit the properties of the material being fed. As a custom extrusion equipment manufacturer, we know the importance of good die design in ensuring throughput and productivity. Expert design balances the melt flow across the die, maintaining continuous uniformity and exit velocity with minimal pressure drop. Die selection also impacts on product quality, since incorrect die choice can cause extrusion issues and problems with final product shape and density. When one of our extruder customers began having trouble achieving successful results from their equipment, we immediately began our troubleshooting process. In this case, product was emerging inconsistently from the die and the extruder was stalling out. The first step is usually to run a trial at our in-house laboratory at Diamond America, using a sample of the customer’s exact extrudate material. 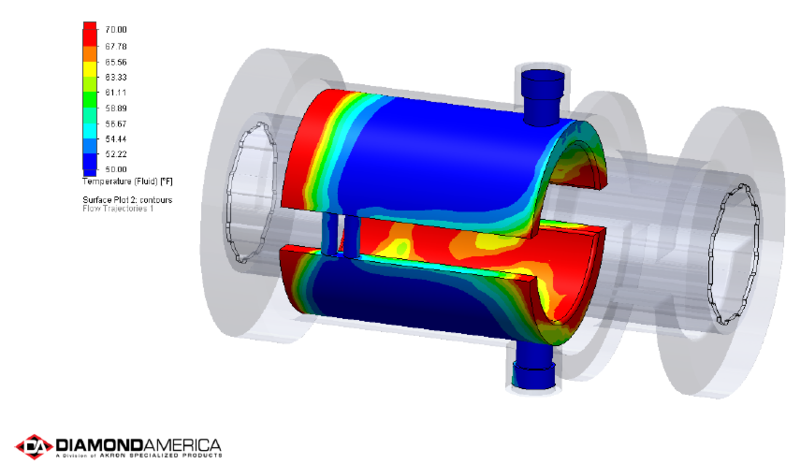 This allows our engineers to evaluate the process, monitoring and testing for potential problem sources. 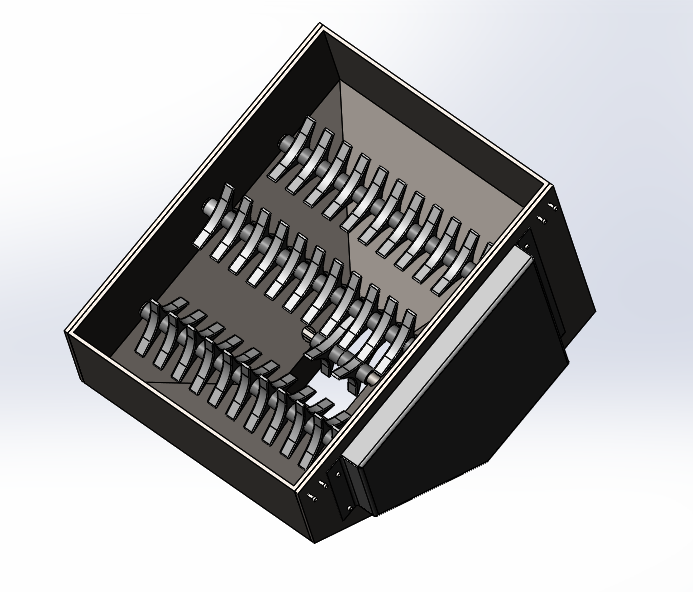 In this case, however, our extruders at the customer’s site had been fitted with dies that had not been made by us, so we asked to review their die design drawings in an attempt to solve the issue. We immediately noticed that the die had been fitted into the land area at the end of the barrel, which is actually intended to be a lead in area (Pilot) for a die or spacer. This meant that the feed material was being fed directly into the die from the end of the screw. This was causing inconsistent feeding into the die, since the root diameter of the screw would not allow enough material to be fed freely into the holes in the center of the die. This would lead to inconsistent product formulation and erratic density, as well as possibly causing the extruder to stall out. To prevent this from happening in our own designs, we use a spacer plate of about ½” to ¾” thickness to allow the correct volume of material to accumulate before feeding uniformly into the die at the appropriate pressure. 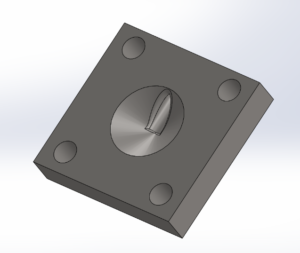 Once this issue was identified in the customer’s die, a quick modification recessed the die plate facing the screw to allow space for the feed material to collect before entry into the die. Lead chamfers into the holes also helped to channel the material more smoothly into the die over the short distance involved – see image 1. Image 1. Modified plate to show recess .050 deep and countersunk holes. This side to face the screw. Ideally, the addition of a spacer ring would have resolved the flow issue completely, allowing space for the material to accumulate, correcting the erratic feed and promoting uniform fill across the die. In the secondary part of the die, the sharp corners at the funnel area were also rounded off to ease the pressure in this area and generally assist with exit flow – see image 2. Image 2. Modification to break sharp corners at lead-in of all entry holes. Implementing the suggested changes to die design achieved the successful outcome shown in the video below, where it can be seen that uniform product is produced to a consistently high-quality standard. Call Diamond America at 330-535-3330 for expert die design to help you achieve perfect results today. At Diamond America, we know that the screw is the heart of every plastic and cold feed extruder. Each screw is engineered specifically to handle the exact properties of its feed material in a way that produces a consistently uniform, high-quality end product. Different screw pitches, depths, and configurations are designed to cater for the material being processed. Once these have been specified and machined, however, the screw remains the same throughout its wear life. There are three separate stages to an extruder screw; the feed, the transition and the metering. Each section of the screw is defined and made for its specific application and, traditionally, these remain fixed. But what if certain sections of the extruder screw could be changed out? 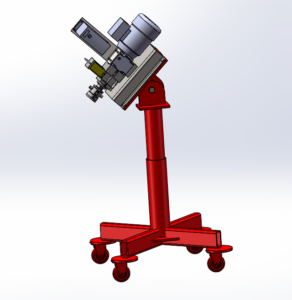 What if the final processing stage at the tip of the screw could be easily altered? What if a screw could be adapted to retain exactly the same metering but have a deeper feed area? All this is now possible, through the innovative engineering of Diamond America extruder screws. As a custom extrusion equipment manufacturer, Diamond America has applied the benefit of many years of experience to screw design in response to market demand for easy process modification. Knowing that flexibility is a growing requirement for extrusion machines, we have creatively engineered a solution to provide exactly that through improved screw technology. Our development team has devised a modular arrangement by which the screws are sectioned into their separate stages, allowing parts of the screw to be changed. A bayonet-style attachment connects each stage securely, yet allows quick-release for efficient screw changes on-the-fly. A screw can be pulled and replaced with minimal loss of process time. The image shows Diamond America’s novel screw connection design that facilitates this rapid changeover. All our screws are designed, programmed and machined at our in-house facility. Precision and quality controls are maintained, daily, to ensure the necessary tolerances are met in order to achieve flawless adaptation. Our in-house testing lab makes certain you achieve the results you require. No matter what your material, we have the experience and historical data to help you design the very best screw for your application. Let the Diamond America experts help you build versatility into your process equipment. Call us at 330-535-3330. In response to a specific customer requirement, Diamond America engineers had to challenge convention and rethink the design of a monolith die. Commonly used for extruding catalysts and some food products, a monolith die produces an outer profile that contains many channels, separated by thin walls. The final product is reminiscent of a honeycomb in the way that it has multiple, parallel holes when viewed from the end. The customer currently produced a profile containing 25 holes in each one-inch solid block of product. A request had come in for them to form a product with only 20 holes. Could they adjust the internal configuration of the honeycomb shape from 25 to 20 internal channels? Or would the whole die set need to be re-made? Our design engineers set to work and created an adjustable mandrel tray – see image. 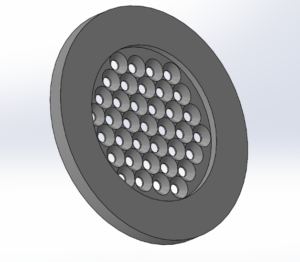 This new design meant that it was not necessary to order a completely new die to accommodate the reduced number of holes. Only the tray and the pins of the existing mandrel die set needed to change. For Diamond America this new, modular invention made the monolith die much easier and quicker to manufacture. Traditional monolith die designs leave the mandrels as an integral part of the second die plate, whereas the new insertable mandrel tray incorporates only the exact number of pins required as an interchangeable part, allowing the mandrels to remain separate from the die plate and thus reducing its complexity. They were able to deliver to their customer, exactly to required specification, faster and without significant additional investment in a completely new die set – now that’s service! Call Diamond America now at 330-535-3330 for your partner in productivity improvement. Seals are an essential component of our oil-filled gear boxes that we design and manufacture in-house for all of our cold feed extruders. In our continuing quest to improve the efficiency of Diamond America extruders, we have stepped up our game in the use of seals. Working in conjunction with a major supplier of seals and bearings we have brought about several innovations that further improve the performance reliability and longevity of our equipment. Oil seals provide a physical barrier that retains the oil but excludes dirt, moisture and contamination. In Diamond America extruders, seals are usually fitted around shafts, hence they are in contact with rotating or moving parts. These are known as “dynamic” oil seals. Our aim was not only to ensure the correct operation of each and every dynamic oil seal, but also to extend its life, exponentially. This would allow our customers to focus on production and product quality, without the worry of machine maintenance or downtime. By applying our effort to improving our seals and shafts, we have improved the seal and reduced wear and, consequently, the potential for breakdowns. This exercise of focusing our attention on a small part of our equipment’s operation has rendered Diamond America extruders practically maintenance free in terms of seals, resulting in longer run times and greater overall efficiency. At our seal supplier’s suggestion, a special, non-grooved finish of 0.2 to 0.8 microns was attained at the exact spot where the seal touches the shaft. This perfect finish is achieved using plunge grinding and special lapping. Changing the seal selection to that of an oil and dust seal combination means there are now two contact points instead of a single one. This new seal creates a larger barrier because it is wider. Since a spring backed seal is used, all shafts are hardened to a minimum of 40 – 45 HRc. This prevents groove formation on the shaft due to the pressure exerted. With efficiency and reliability designed into every part – Call Diamond America us 330-535-3330 for your custom extruder now. Machining special shapes such as complex extrusion dies, or the grooves in barrel liners, is accomplished by Electrical Discharge Machining or EDM. A small wire laces through the steel, cutting it with very precise accuracy to tolerances of .0004. Parts formed using the EDM process have a very distinct color and surface finish. Smooth to the touch, the finish can be held to just a few microns and is occasionally even better than a ground finish. When we viewed an EDM cut surface under a microscope at Diamond America, however, we spotted minute peaks and valleys that meant there was still scope for some improvement. Further tests in our lab on dies cut using EDM revealed an astonishingly vast difference between raw parts, straight after cutting, and those that had been subsequently hand polished. Throughput rates jumped on the hand polished dies, compared to considerable drag experienced on the unpolished ones. This inspired us to further investigation – what if we polished our liner grooves? Removing the EDM finish from liners created the same results. Material did not clog in the grooves, allowing easier cleaning. Simple glass beading and hand polishing eliminated all stickiness. Higher Output: Less drag and friction in the die or barrel means that feed material moves more quickly throughout the process. Faster Cleanup: Easier removal of material from screw, barrel and die makes for rapid cleaning and reduced changeover times. Shorter Break-in: Pre-polishing of surfaces means that there is no waiting time for internal smoothing. Finish quality is immediate. Better Final Product: Improved material flow fills die corners without tearing and yields an end product that is truer to the actual die shape. – Call Diamond America at 330-535-3330. Diamond America is pleased to introduce our first cold feed extruder with a vented barrel. Formerly, venting in a cold feed extruder was achieved by removing a batch of extrudate into a hopper or chute and pulling a vacuum on the material for a calculated period of time. Borrowing from the thermal plastics process, internal venting has been implemented to effectively pull a vacuum on the material while it is still in the extruder barrel. This smart technology transfer enables trapped air or moisture to be removed from the extrudate without the need to stop the process. A diaphragm-style plug is inserted into the barrel to create an open section at the transition point in the screw. Due to pressure as it passes by this vacuum port, the material is forced into the specially contoured recess allowing excess air or moisture to be drawn out of it in the process. 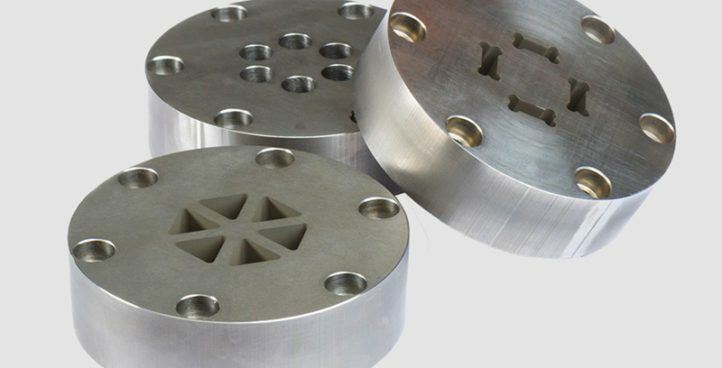 Our experienced Diamond America design engineers can fine-tune this special plug to meet the demands of many types of extruded material that requires venting. Many manufacturers need moisture, impurities or certain volatiles to be removed from their material in the extrusion process. In the past, removal could be time-consuming and, sometimes, even ineffective. In-process venting, using a specially adapted Diamond America Extruder, pulls these unwanted components away from the material without stopping the motion of the screw, keeping the product running continuously through the equipment without engendering any delays. Diamond America customers who have purchased extruders that accommodate venting are very satisfied with the resulting improvements in productivity and efficiency. Testing in our own laboratory has shown a significant reduction in voids and impurities after the firing process, for products made of graphite and clay, when a vacuum is drawn on the material in Diamond America extruders that use our barrel plug technology. We are also currently testing this new venting method to remove gases from our proprietary pure white ceramics. These products cannot afford to contain any voids that could allow the possible formation of bacteria. Diamond America machines are made of 100% food grade stainless steel, perfect for any application requiring process sterility. The venting plug can easily be changed to a solid plug, meaning that even our extruders which incorporate the new vacuum technology can quickly be transformed into non-vented extruders. Diamond America’s clever modular construction also means that the entire vacuum section can be easily removed, if required, by the release of a couple of lock screws. The barrel can then slide back to mate up to the same flange, being secured with a shorter screw or an added spacer if a sectional screw has not been incorporated into the design. The options are almost unlimited with our custom extruder designs, with the added benefit of incorporating our new barrel venting technology where needed. Diamond America customers rely on the modular design and flexible venting options of our Custom Extruders to meet their specific production targets and end product quality requirements. Call Diamond America Now at 330-535-3330 to find out now our specialist extruder technology can increase your efficiency. Extrusion process temperature control is crucial for many materials, especially those dealing with sensitive ingredients in the food and pharmaceutical industries. That’s why Diamond America engineers developed Serpentine Flow to provide better temperature uniformity, more quickly and continuously, without any dead spots along the barrel. We’ve received a lot of questions about how our Serpentine Flow technology provides better thermal control during the extrusion process. Watch the video below to see how it works! Click here to see how it works – download our Barrel Heat Exchange Study with specifications. Call us at 330-535-3330 ask us now how this Diamond America innovation can help your custom extrusion application. Across industries and materials, we’ve found that maintaining temperature with materials during the extrusion process has a direct impact on the bottom line. The problem is that regular screw extrusion systems heat or cool the barrel from one end to the other, so there is always a temperature gradient, even across a ‘controlled’ temperature zone. These temperature gradients can reduce energy efficiency, slow process time, even lead to losses from barrel leakage. For some, accurate cooling is necessary to ensure process temperatures never exceed certain maximum values. Other customer applications require extruder barrels to be more responsive when heating or cooling, quickly achieving optimal process temperatures whilst retaining accurate thermal control. All require optimization of energy usage in their extrusion processes. Diamond America engineers brainstormed new ideas for cold feed extruder barrel design, with the aim of achieving greater thermal stability and control. Using computer simulations, various options were explored, specifically looking at speed of reaction to thermal changes and streamlining of the flow. One solution far outstripped the alternatives, achieving better temperature uniformity, more quickly and continuously, without any dead spots along the barrel. Using Serpentine Flow principles, a circuit-type flow is obtained in the barrel liner, by passing the coolant through many narrow channels along the length of the barrel. Continuous flow means that barrel construction is less susceptible to leaks, allowing no possibility of stagnant flow whilst creating even temperatures across the section. This novel, intuitive method, which can be used with any extrudate, was unveiled at the Ceramics Show in Cleveland, Ohio on April 26th, 2017 at The International Exposition Center, better known as the I-X Center.